Ishikawa is situated on the western coast of the mainland facing the Sea of Japan. The prefecture is blessed with spectacular mountain ranges and a beautiful coastline that stretches more than 580 kilometres. The capital, Kanazawa, is famous, amongst other things, as the home of Kenrokuen - one of the three most beautiful gardens in Japan. 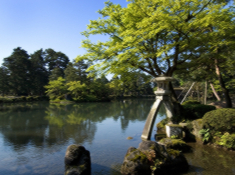 The garden covers a total area of more than 25 acres and is one of Kanazawa's main sightseeing spots. Ishikawa is also the home of Mount Hakusan, one of Japan’s Three Great Sacred Mountains, along with Mt. Fuji and Mt. Tateyama. 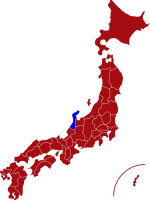 For more information about Ishikawa prefecture, see their official tourism website. Air - Komatsu airport is located less than 40 minutes away from the city centre of Kanazawa. The airport operates daily flights to Tokyo, Sapporo, Sendai, Fukuoka and Okinawa. Click here for its English website. Rail - The main train station in Ishikawa is Kanazawa Station. The station has regular high speed trains to major Japanese cities and the journey time to Tokyo is less than two and a half hours. Kenrokuen Garden is recognised as one of the three most beautiful gardens in Japan. The garden is located next to Kanazawa Castle and covers a total area of more than 25 acres. 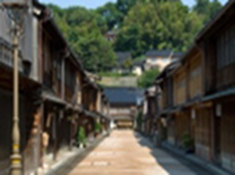 Higashi Chaya District consists of rows of traditional Japanese teahouses that have managed to preserve the charm and atmosphere of a bygone age. 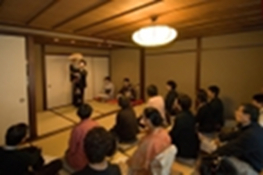 Geisha Show - Kanazawa is one of only a few cities in Japan where visitors have the opportunity to enjoy authentic geisha entertainment. 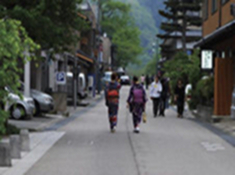 Yuwaku Onsen has a proud history dating back to 730 AD and is one of the most popular hot spring resports in Ishikawa.